I really wanted to like this book, because I have been looking for lesbian zombie apocalypse books for years (luckily, there are more than just this one now, but still). Luckily, this book is just as good as it sounds. First of all, it’s hilarious. I kept reading out passages to my partner, but I’d only get another sentence in before I wanted to read out more. This is mostly because the main character, Devin, is sarcastic and funny herself. The zombies appear pretty much from the first sentence, and Devin is already in a lesbian relationship from the beginning, so there’s pretty much no build up to getting to the meat of the story. The zombie action has some of its own mythology, and there is definitely enough gore for a zombie story. In fact, it gets pretty sickening, and Devin sustains a realistic amount of injuries for being a random, untrained person caught in a zombie apocalypse. Rodriguez fanfic. She goes by a different name in the book–Renni Ramirez–but the book is dedicated to Michelle Rodriguez, and it’s a pretty obvious substitution. Renni and Devin fight off the zombies together, using Renni’s movie-gained zombie-fighting skills, and attempt to rescue Devin’s girlfriend. This is definitely a book I’d recommend, and I look forward to more from this author. Also, check out the awesome inscription by the author. 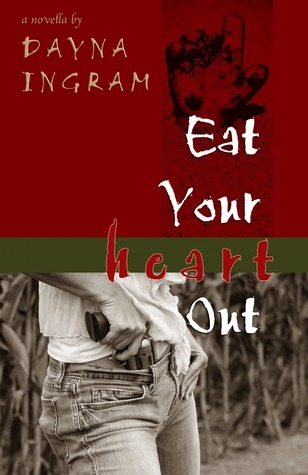 This entry was posted in Lesbrary Reviews and tagged danika, Dayna Ingram, Eat Your Heart out, lesbian, zombie, zombies by danikaellis. Bookmark the permalink.